Image Analyzer is a simple but surprisingly effective utility for the advanced analysis, editing, and optimization of images. It supports many many formats and it's remarkably easy to use for an imaging software of such sophistication, not to mention it's completely free. In particular, it's very good with handling formats of all conceivable types including support for the new standard JPG 2000 image compression format. Professional designers will probably find the interface way too limited however but for novices its absolutely perfect because it really does not require any prior knowledge. 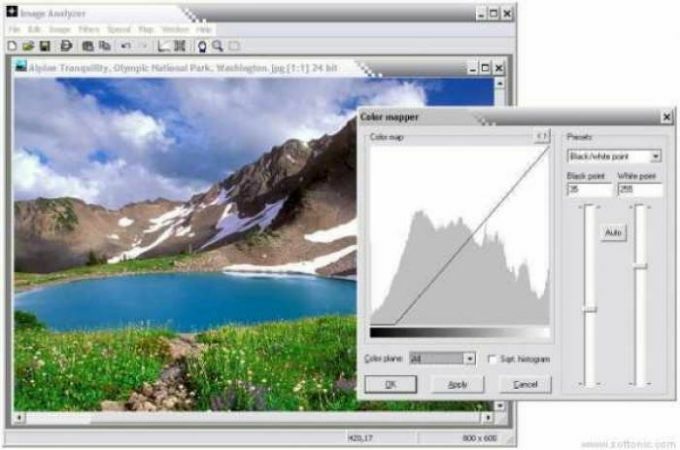 In terms of image editing, the program features options for resizing, cropping and image rotation among several others. There's also simple adjustments like levels of brightness, contrast and saturation available. Other key features include automatic brightness, contrast, gamma and saturation adjustment, a Retinex filter for reducing shadows and increasing local contrast and the all important red eye remover. It also supports most types of scanner, cameras and printers although not all. A deceptively simple program that is rich in features and powerful enough for those beginners that need a bit more image processing power. The program contains both most image enhancement features found in conventional image editors plus a number of advanced features not even available in professional photo suites. What do you think about Image Analyzer? Do you recommend it? Why?